Don't forget that Manana will be open from 27th December until the 2nd January from 6pm onwards so why not pop in for a Mexican Christmas fix! They are open on New Years Eve from 5.30pm and will be taking bookings for one night only. They have a few tables left for what is sure to be a fantastic way to welcome in 2012. If you want to book a table then give them a call on 01758 713373 or 07966 619504 and enjoy new year Mexican style! The Coconut Kitchen will be open every night until Friday 23rd December and will be re-opening on Tuesday December 27th until New Year’s Eve. On New Year’s Eve there is a special Party Banquet Set Menu with 2 sittings and a late bar until 1am, please call 01758 712 250 for details. There will be no takeaway available on New Year’s Eve. Coconut Kitchen would like to take this opportunity to thank and wish everyone a very merry Christmas and a happy new year and they hope to welcome you when they re-open in early March 2012! As we mentioned a while back, John Higson is taking part in the Talisker Whisky Atlantic Challenge rowing race, which is currently heading across the Atlantic! The race is now in its second week and progress has been slow so far, presumably due to very rough weather. On Tuesday, another boat capsized and its two crew were rescued from a liferaft by a cruise ship. 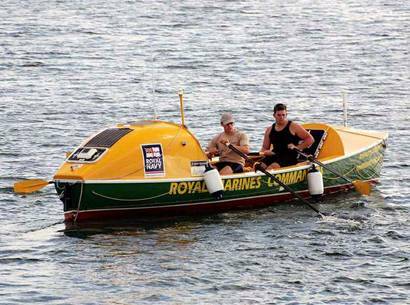 You can keep update with John's progress in the "worlds toughest rowing race" , by clicking here. His boat is "Go Commando". Don't forget you will need a sponsor form for you or your family if you are thinking of taking part in this year's New Year Dip (details on how to obtain them are to be found a few items below this one). Abersoch Lifeboat was called out again yesterday in very rough winter seas and was tasked to go to the Aberdaron area. With a westerly gale blowing and a very large winter swell running, it was decided that the lifeboat should be turned round before Cilan Head and returned to Abersoch Lifeboat Station. Wakestock HQ are incredibly chuffed to announce that the legendary DJ CALVIN HARRIS has been added to the bill and will join Ed Sheeran as one of our 2012 headliners. There are still a limited number of Earlybird tickets available but make sure you book soon! CALVIN HARRIS has been something of a Wakestock favourite over the last few years and will return in 2012 with his all new show. After a dramatic rise to the top, this guy is one of the best in the business. With an amazing back catalogue including his number one hit “I’m Not Alone” and many more including collaborations with the likes of Kelis and Rihanna , his sets are something to behold and he’s sure to get the party going at Wakestock this summer. He is currently touring with Rihanna off the back of the amazing number one single “We Found Love” and we are so excited to be welcoming him back. With a new album coming in 2012 Calvin is going to rock the Wakestock crowds once again! 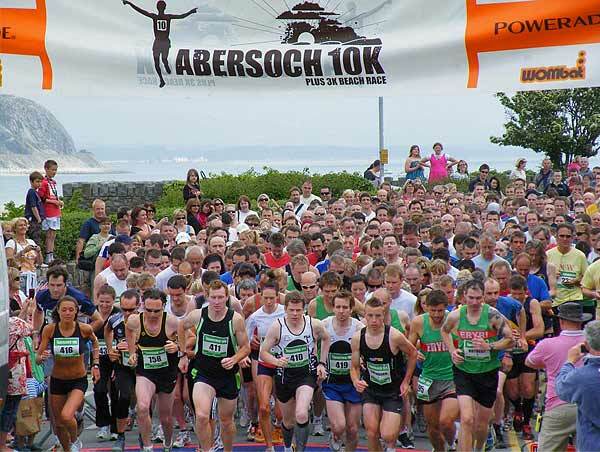 The 10K's official charity is the Abersoch Royal National Lifeboat Institution. Providing 24 hour lifesaving service for Abersoch and the surrounding coast, the service is invaluable to anyone that ventures out on the water, and runners as well as people watching on the day are asked to support this great cause. The race will be held this year on Saturday 9th June. ...they are available at the Abersoch Tourist Office, Abersoch Boatyard, OSD and Boardrider in the village. Alternatively you can download a spnosor form here as a pdf file, or you can use the Virgin Money Giving website and set up your sponsorship using the Abersoch RNLI Dip event page. It has been set up so that all fundraisers using that system will have their money donated directly to Abersoch RNLI Station. The Virgin link page can be accessed by clicking here. Any queries can be addressed to abersochdip@hotmail.co.uk. The RNLI Abersoch website has more details of their search in treacherous sea conditions on Sunday. Family rooms available. 01758 712526. Local lifeboats, coastguards and RAF helicopters have resumed the search this morning for the missing 5 crew members off the "Swanland". Sea conditions are again rough and likely to get rougher, making it a difficult task for all involved. 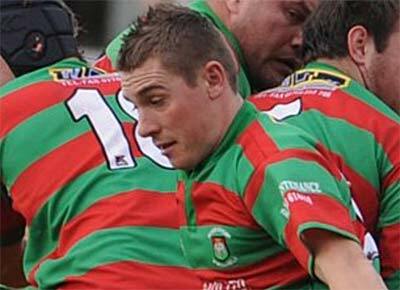 There will be a rugby match followed by a charity auction at Pwllheli Rugby Club on Wednesday 28th December at 5pm. The match is in memory of Will Hughes, who was lost to our community in August. The charity auction has some special sporting memorabilia, including a shirt signed by the entire Wales World Cup Squad. Bids can be made by phone or email. For more details on the match and auction, click here to view the event poster. Enjoy some seasonal loveliness and raise money for the local school this Sunday (27th November) at the Dining Room Abersoch Christmas Fair. £3.50 entry includes some mulled wine and a mince pie. For this and all other Dining Room info, visit their website. The official Abersoch 2012 Calendar is on sale at just £9.95 and would make a great stocking filler for anyone that loves the village. If you have a few stockings to fill then there’s also a special rate of £25 for 3 calendars (postage included), all posted directly to your door within 3 days. Another great gift idea is an annual subscription to Abersoch Sensation Magazine at just £8.50 for all 3 issues or £16.50 with calendar, and all subscriptions before Christmas come with a cool ‘Congratulations, you are now subscribed to Abersoch Sensation Magazine’ gift card, perfect to give to the lucky recipient as a present. Just call 01758 710011 to make your order. There will be a charity chest wax at the Sun Inn Saturday 3rd December from 5pm with music from The Kickbacks and much more. Can you help? Do you need waxing ?!!!! The more the merrier! Wakestock organisers are thrilled to announce the festival will return to the same site near Abersoch on July 6 / 7 / 8th 2012. The first announcements about this year’s music line up and wakeboarding action will be coming soon. You can also book your car parking, shuttle bus, Thursday night pre party and locker tickets at 2011 prices when you book your festival tickets. The tickets themselves won’t be sent out until June next year, but if you are lucky enough to get your hands on arlybird tickets you will be sent a voucher confirming you booking which is ideal if you are buying tickets as a Christmas gift. For more information check the website at www.wakestock.co.uk or call the Wakestock information line on 01758 741095. Don't forget the annual New Year's Day Dip on Abersoch Main Beach is coming up and to take part, you'll need a sponsor form. These are available at the Abersoch Tourist Office, Abersoch Boatyard, OSD and Boardrider in the village. Alternatively you can download a spnosor form here or you can use the Virgin Money Giving website and set up your sponsorship using the Abersoch RNLI Dip event page. It has been set up so that all fundraisers using that system will have their money donated directly to Abersoch RNLI Station. The Virgin link page can be accessed by clicking here.
. All money raised goes directly to the Abersoch station to help with training the crew and supporting team members. As usual, the dip will be held on the main beach at 12 noon, with children running in first before the adults. The organisers are looking forward to seeing the usual imaginative interpretations of their chosen theme of The Olympics. If last year’s effort is repeated, over 300 people are expected to hurdle over the waves into the sea, supported by around 2,000 spectators. Any queries can be addressed to abersochdip@hotmail.co.uk. Wakestock returns to Pen Llyn next year and it will be held on 6th, 7th and 8th July 2012. See www.wakestock.co.uk for more info. Here is a rather amazing story of how a mystery child survivor of a shipwreck off the coast of Anglesey became a famous "bone-setter" and led to the discovery of techniques still used in modern orthopaedic surgery today. The Olympic Torch is due to pass through Pwllheli on May 28th, 2012. The relay map can be viewed on the BBC website here. Mae Llywelyn, bachgen lleol, yn dangos dewrder ac ysbrydoliaeth er gwaetha'r ergyd drom a gafodd yn ddiweddar. Yn dilyn damwain, mae o ar hyn o bryd yn Ysbyty Gwynedd yn gwella o anafiadau difrifol ac yn mwynhau cariad ei deulu a'i ffrindiau, gan dynnu sylw ambell nyrs yn ogystal! Mae'r gymuned gyfan yn dymuno'n dda iddo. Sefydlwyd cronfa ymddiriedolaeth a chroesewir rhoddion drwy Fanc y Natwest, Abersoch neu drwy law yr ymddiriedolwyr, Linda Jones a Rob Middleton. Diolch ymlaen llaw am eich cefnogaeth. Llywelyn, a local teenager, is showing inspiring courage in the face of adversity. Following an accident, he is at presently in Ysbyty Gwynedd recovering from serious injuries, surrounded by the love of his family and friends, and attracting the attention of a few nurses too! The whole community wishes him well. A trust fund has been set up and gift donations are welcome via the Natwest Bank, Abersoch or the trustees, Linda Jones and Rob Middleton. Thank you in advance for your support. Local photographer John Wormald snapped this spectacular shot yesterday of a rainbow over the Warren Beach. According to this week's Caernarfon Herald, JD Weatherspoon's are moving into the old and derelict Bon Marche building in Pwllheli, creating up to 45 jobs. For the full story, click here. Hardly a week goes by without a doomsday weather prediction headline for the coming winter in newspapers such as the Daily Express. As these reports can be confusing, we have listed some of the forecasts that are behind these headines and also provided some of our own thoughts on what might happen. Click here for the article. 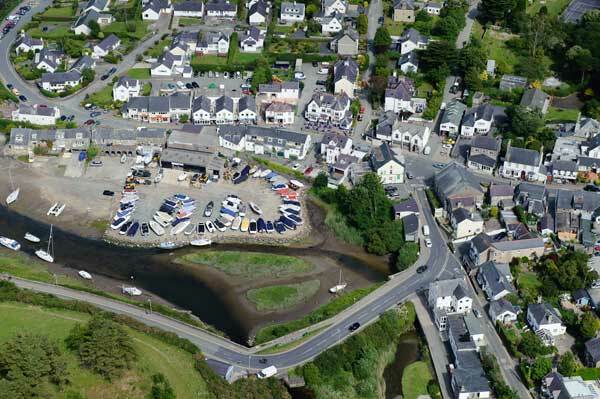 Pwllheli Marina was on the BBC Wales news last night..."Gwynedd council has approved plans aimed at boosting the number of people using Pwllheli marina. Mooring fees are to be frozen and dredging work carried out to improve access to the 400-boat marina. The council says the economic downturn has affected the business, which supports around 200 jobs in Pwllheli, with berths lying empty." Click here for the full BBC video news item. Buy one...GET ONE HALF PRICE! - Now Includes Friday's! John Higson, from Abersoch, is competing in The Woodvale Challenge, Atlantic Rowing Race 2011 with friend Barny Mabbs. The race is due to begin on the 4th December and they are currently expecting to see at least 9 boats compete (entries from all over the world) for the fastest crossing time. The average can be expected to take around 70 days, with the quickest being a little fewer than 50 in good weather. All the boats have to be entirely self-sufficient and carry with them supplies to last 90 days at sea for the entire crew. In their bid to win the Atlantic Rowing Race 2011, they are raising money for Cancer Research UK, a charity very close to their families hearts and a very worthy and inspirational cause. Donations can also be made in person to Mrs Janice Higson in Natwest, Abersoch, the mother and on-shore worrier of/for John. More info on John, Barny, their boat and the race can also be found by clicking here. Petal-á-Pot and Abersoch Garden Centre is a family run business owned and run by Dave and Dianne Collins. Petal-a-Pot has long been known for its traditional afternoon teas, served with scones, homemade cakes and quiches. Also Dianne’s stunning and elegant, bespoke Celebration Cakes ‘fabulous cakes designed to thrill’. Sample hand made, luxury Belgian chocolates with your coffee. They aim, wherever possible, to source their ingredients locally. These include local welsh cheeses, welsh mature black beef, local seafood (crabs and lobsters) caught locally around the Llyn Peninsula, locally produced baked bread, and when possible vegetable and salad goods are home grown in their greenhouse. Once again you can get rid of your New Year’s Eve hangovers by sprinting into the sea for the annual Abersoch RNLI New Year’s Day Dip. This year the fancy dress theme is ‘The Olympics’, so let’s make an Olympian effort to raise as much money as possible for our wonderful lifeboat crew. All money raised goes directly to the Abersoch station to help with training the crew and supporting team members. It is expected that if you join the dip you will raise some money for the lifeboat crew who will be on and in the water at the event to look after everybody’s safety, so, to take part, a sponsor form is needed and these are available at the Abersoch Tourist Office, Abersoch Boatyard, OSD and Boardrider in the village. Alternatively you can download a spnosor form here or you can use the Virgin Money Giving website and set up your sponsorship using the Abersoch RNLI Dip event page. It has been set up so that all fundraisers using that system will have their money donated directly to Abersoch RNLI Station. The Virgin link page can be accessed by clicking here. "Come and join us- have a glass of champagne and look around our beautiful site on Saturday 22nd- Sunday 23rd or the following weekend Saturday 29th- Sunday 30th October between 10am and 4pm. There will be show lodges open and the team will be on hand to guide you around the lodge park and the amazing facilities including the glorious natural environment of woodland, lakes and swimming pool and tennis courts. There are lodges for sale in the park at the moment and there are great investment opportunities." Please call Vicky on 01766 819098, email Vicky@thesanctuarylodges.co.uk or visit our website www.thesanctuarylodges.co.uk for further details. Another for sale sign has gone up outside a shop in Abersoch this week with Trespass apparently attempting to bail out of the village. 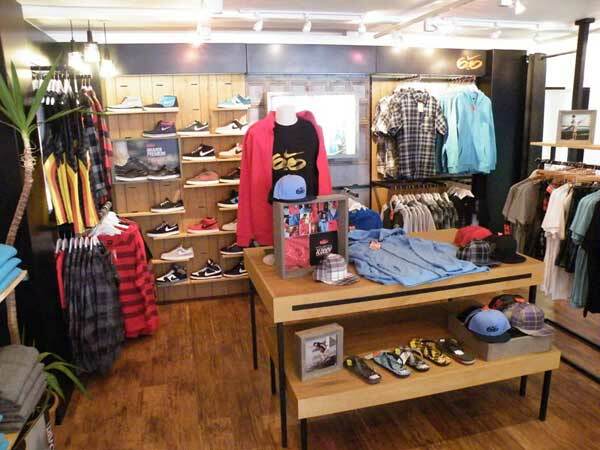 Trespass is one of a number of shop chains that moved to Abersoch over the last decade and is the first one to be leaving and according to rumours in the village, may not be the last. Whilst benefitting the shopping experience for consumers in Abersoch, the chain stores have had a negative effect on local independent retailers, who have seen increased competition and their rents increase dramatically. The cashpoint in Abersoch is also causing retailers, locals and visitors frustration due to it being out of service on a very regular basis. It is unclear whether this is due to it running out of cash or whether it is a technical issue. One shopkeeper told Abersoch.co.uk this week that ..." it's a complete joke. It has always been a taboo subject to criticise HSBC over this cash point as they apparently did the village a "huge favour" by keeping it open after they closed down the bank, but, what is the point of a cashpoint if it is out of service so often that no-one can rely on it?" Cash can be obtained at the post office counter terminal at no extra charge. However, the one leading bank whose cards you cannot use for cash withdrawals is ........ HSBC! Following on from the items below about unusual visitors to the Abresoch area, on October 3rd, a very rare moth, a Crimson Speckled, was caught in a moth trap at Bwlch Tocyn. This moth is an immigrant from Southern Europe and the few records that there are of sightings show that it is normally only seen on the south coast. There are also four records from the South Wales coast and one was recorded in Anglesey in 1978. This is very pretty moth having a white wings with red and black speckles and is 17-22mm in length. If you spot one please contact this website with details of when and where and a photograph. Moths caught in specially designed traps, to which they are attracted by a special light, rest happily once inside the trap. They are photographed and recorded before being released unharmed. For photos of the 2 insects (taken by the finder) - click here. 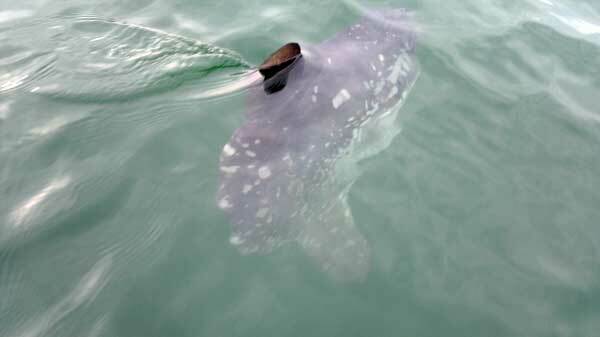 Barry Davies has e-mailed us this photo of a very rarely sighted visitor to our waters, a sunfish. He spotted the fish just off the Criccieth on Saturday. The sunfish normally lives in warmer seas and feed on jellyfish. The dates are as follows (times to be confirmed). Local yachtsman Bob Kennedy spotted this basking shark swimming inside of the moorings off Abersoch Main Beach on Saturday morning. He estimated the length of this non-dangerous shark to be approximately 3m long. Basking sharks are spotted off the coast of Pen Llyn from time to time, but this one is much closer to shore than usual. 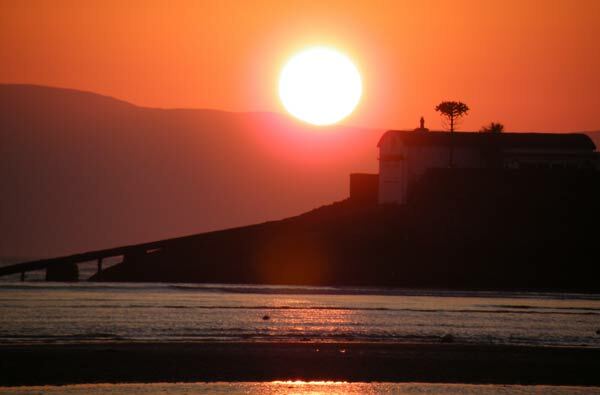 There was another rather special sunrise in Abersoch this morning. Click here for more photos. Abersoch has been enjoying some very fine weather this week, with some fantastic beach weather and glorious sunshine. This morning saw a lovely sunrise, which was captured on the beach in the photo below. Clwb camera Dwyfor Camera Club are holding an open evening next Tuesday 4th October, 7.30 in the Abersooch village hall, showing work done by members. All are welcome. The club meets every Tuesday evening at 7.30pm in the village hall, from the beginning of October until the end of April. New members also always welcome! After a brilliant festive season last year and lots of requests already this year, The Dining Room are sending their Christmas party menus out early. They are also starting 'party season' a little earlier, with their festive offerings available from mid November. For the menu and all other Dining Room info, visit their website. Sept 28th, 2011 - October special offer at The Coconut Kitchen! Buy one...GET ONE HALF PRICE! The Coconut Kitchen will be open 6 days a week in October (closed Tuesday) with this special offer available every day except Friday and Saturday. Buy any starter get the second one half price. Buy any main course* get the second one half price too! Also available in October... we will be offering our special THAI Streetfood menu. So it could be Sai Oowah (spicy Chiang Mai sausage), Hoi Joh (crispy crab and pork parcels), Moo bing (chargrilled pork skewers), Khaw Mok Gai (South style chicken thighs and yellow rice) or Knom Jeen (Thai rice noodles and pork ribs in a chilli, tomato and lemongrass sauce) to name but a few. The menu will vary from week to week but we guarantee some great dishes for you to try and although we can't quite match the prices of a Thai street market the same great offer applies to this menu too! The October Buy One Get One Half Price offer runs from October 2nd until October 20th 2011. Does not apply to side dishes, puddings, drinks or steak*. Not available Friday or Saturday. The cheapest dish purchased is charged at half price. Offer only available in the restaurant does not apply to takeaway. This will take place at Oriel Plas Glyn-y-Weddw, Llanbedrog on Thursday 13th October 2011 at 7.30pm. 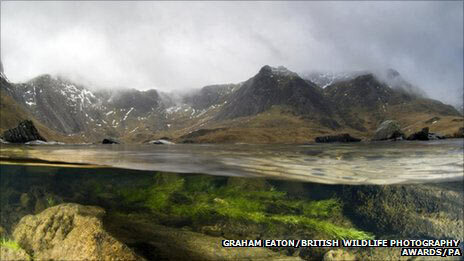 According to the organisers, "Graham Eaton is a widely published photographer, who likes to challenge convention. So come along and experience some of his ‘views and perspective’… you might see some well known landscapes and animals photographed in a very different way. Hopefully, you will be inspired by his work, and leave refreshed and eager to pick up your cameras….. Admission is £4 including refreshments . Tickets are available from Oriel Plas Glyn-y-Weddw reception. Graham has kindly agreed that all proceeds will be donated to support Friends of Plas Glyn -y- Weddw and the RNLI. 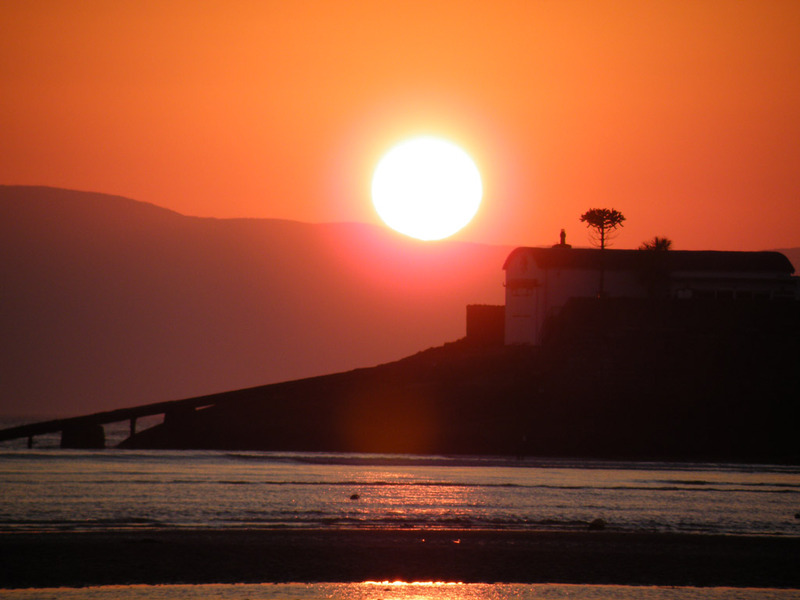 The event has been organised by Dwyfor Camera Club, which meets weekly in the Abersoch Village Hall on Tuesday evenings from October to April. New Members are always welcome and the first open meeting of the 2011/12 Season will start at 7.30pm on Tuesday 4th October 2011. The Daily Post leads this morning on the tragic news of the death of Will Hughes in a road accident yesterday morning. The BBC is reporting the incident at Abersoch yesterday..." A woman had to be rescued by coastguards after a crash involving a jet ski and a boat off Gwynedd. The woman suffered suspected broken ribs when the jet ski mounted the boat she was on near the main Abersoch beach. Holyhead coastguard said the Abersoch team was deployed to help at 12.25 BST on Saturday. The woman was taken to Ysbyty Gwynedd in Bangor for treatment." The final line up has been announced for the first Glass Butter Beach Festival to be held in September. Read more on this story at the Caernarfon Herald website or for more festival information, visit www.glassbutterbeach.com. A booklet has been launched to celebrate the 125th Abersoch Regatta. For more details visit the Caernarfon Herald website. Author George Chedzoy has recently finished a novel based around this locality called Smugglers At Whistling Sands. It is set primarily in Abersoch but the action also moves to other locations along the Llyn peninsula, including Porth Oer, as you will gather from the title, Smugglers At Whistling Sands. Fancy getting on the water this summer for free? Well from Saturday you can! Laser Performance will be on the beach at The Warren with 6 Bug sailing dinghies from Saturday 20th until Tuesday 23rd August. The Bug is described as the perfect beach holiday boat for all, being stable and spacious with ample space for 2 children or 1 adult. The Bug can be sailed with the standard sail or easily switched to a race sail, which offers more speed from its larger sail area. There’s no charge to have a go at sailing the Bug. Instruction, safety cover and buoyancy aids will be provided for all sailors. Sailing will be available between 12 noon and 4pm. Abersoch RNLI Lifeboat was launched on the 8th August to reports of children in the water, having fallen out of an inflatable dinghy that had been blown out to sea in offshore winds. Fortunately for the 2 children, a passing windsurfer had spotted them in the water and all 3 of them clung onto the windsurf board and waited for help. The Abersoch Lifeboat was launched and soon located the 3 persons. The 2 children, who were not wearing buoyancy aids, were found to be cold and tired but otherwise unharmed. It appears that without the assistance of the windsurfer, the outcome could have been a tragic one. For the latest information on Abersoch RNLI Lifeboat services, click here. A GROUP of friends have been talking about their tragic loss after a popular young woman was killed in a car crash recently. Melissa MacKenzie, 21, from Pwllheli, died during a road crash on her way home from a meal with her twin sister. According to friends, Melissa will be greatly missed by countless people in the Llyn and Eifionydd area. To read more, visit the Caernarfon Herald Website. THE organiser of the Llyn Peninsula’s newest festival is confident it will be a big success. Mark Durston, who founded and ran the Wakestock festival for 10 years, says preparations are going well for his new Glass Butter Beach Festival, which kicks off in Llanbedrog on Friday, September 2nd. For the full story visit the Caernarfon Herald website or for more festival information, visit www.glassbutterbeach.com. Graham Eaton, an award winning wildlife and natural history photographer, recently sent us this image of a "waves eye view" of the Warren and Llanbedrog headland. The waters in the bay have been very clear recently, especially under the clear blue skies of earlier in the week (when this photo was taken). 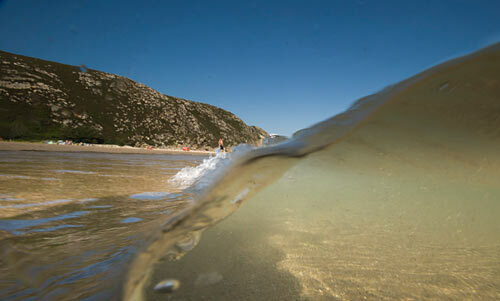 Graham is a regular visitor to Abersoch and has an amazing set of underwater photographs taken in our local waters. Graham will be giving a talk on his work in the autumn and we will give timing and ticket details once they have been confirmed. With the school holidays now underway, Fish ‘n’ Trips' fishing boat, Jenny II will be busy in the bay off Abersoch and is normally out every day (weather permitting). 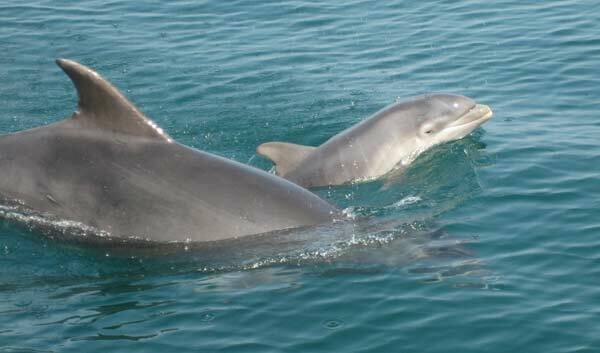 Skipper Phill Brown tells us that there has been plenty of dolphin activity recently for the trippers to enjoy and Jenny II will be involved in the National Dolphin Watch on August 5th – 7th. He also says that the mackerel fishing trips have had mixed results, sometimes catching readily but other times the mackerel have been hard to find. Happily the seals out by the island seem as inquisitive as ever! Details of bookings and trips can be found at Present Thoughts (Abersoch Angling), the gift shop opposite The Vaynol public house in the middle of Abersoch village. Some great news today for all users of the sea in North Wales is that Holyhead Coastguard Station has escaped the cuts and will remain open! Click here for the BBC website coverage. This years Wakestock Festival in Abersoch, Penrhos and Pwllheli has been the most successful to date, according to the organisers. The festival saw mixed weather leading up to the event with high winds on Wednesday night causing some concern over the huge tents that had been erected. Fortunately the tents survived the battering of 70mph gusts and, unlike some years, the land at the old airfield in Penrhos stayed relatively dry, with mud not a big issue. Friday's showers were replaced by blue skies and warm sunshine for the rest of the weekend with the mostly young festival goers filling Abersoch and its beach during the daytime and, despite the litter issues mentioned on an earlier item, the vast majority were well behaved and were clearly having an excellent time. Headline acts at the festival included Ellie Goulding, The Wombats, Biffy Clyro, Chase & Status, Kelis, Example and many more, including the increasingly popular Plastic Thumbs. The wakeboarding side of the event again took place at Pwllheli Marina with the impressive pool gap competition held at the festival site and a big air competition on Abersoch Main Beach on Sunday afternoon. All the results can be found at the Wakestock website. For next year, despite rumours to the contrary, it looks very likely that the event will once again take place here on Pen Llyn. Stuart Galbraith, CEO of festival and music company Kilimanjaro (who run the event), told abersoch.co.uk yesterday, "We have just finished this year's event which has been the most successful event to date. In a couple of weeks time when everything is finished up we will be looking at all the options and plans for 2012. We would like to thank all of those who have supported the event and made it such a success." Details of next years event will appear on the Wakestock website and facebook page in the very near future. Today is the day when the final decision will be made on whether the important HM Coastguard station at Holyhead will remain open. This station co-ordinates all the search and rescue operations on the water over North Wales. The "cuts" have been threatening this and other stations for some time, with the final decision being delayed due to an extension in the consultation process. The BBC is covering this story here. The BBC are reporting that a meeting will take place this evening discussing the serious silting issues at Hafan Pwllheli Marina, which is restricting access for the bertholders and visiting yachts. One issue raised by the article is that a Gwynedd Council spokesman says, "It is worth noting that the original plans for Hafan Pwllheli never included 24-hour access." What he does not say is that "24 hour access" was used as a selling point to potential berth holders for many years and they did not point out at anytime that 24 hour access might only be a temporary bonus due to "over dredging". To read the BBC article - click here. The 2011 Abersoch Regatta events will include the return of the popular junior raft race for 8 to 14 year olds. The junior race was cancelled in 2010 due to insurance and H & S reasons. This year the RNLI have helped organise this event and we will have details on how to enter and on the other events in the very near future. For a list of the event dates and times - click here. On Sunday afternoon and Monday morning, Abersoch appeared to have been covered in a sea of luminous yellowy/green bottles. They were all over parts of the beach, on the roads, under hedges, in gardens, on parked cars, infact everywhere! . We are not going to mention the brand of drink that gave these bottles out free and created such an extra sea of litter, as we don't want to give them any free publicity - however, it should be noted that they were nothing at all to do with Lucozade, who were legitimate sponsors of the Wakestock Festival. The bottles were given out by a company "piggy backing" or "free loading" on the Wakestock festival and appear to be part of the Pepsi/Britvic group in the UK. The Wakestock organisers are furious that this took place and also that they appear to have been blamed for this very visible form of litter. Those who dropped the bottles or threw them all over the place, obviously share a large portion of the blame. On the subject of litter, the large numbers of young people entering Abersoch on Saturday, caught the Wakestock organisers and the council by surprise, which meant the main beach and bus stop areas in particular saw a vast amount of litter piling up. By Sunday, most of these issues (not all) had been addressed and we are told it is an issue that the organisers will look closely at for next year's festival. 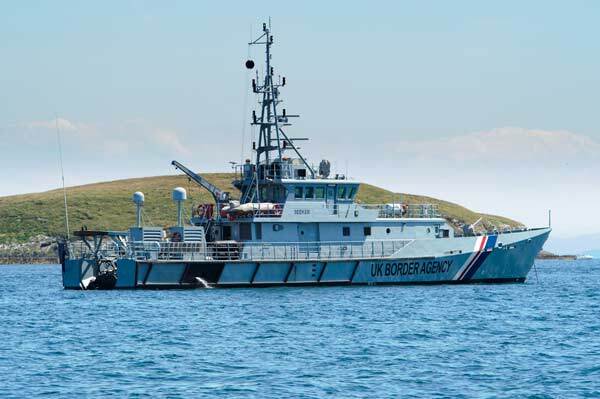 Last week, Abersoch Bay was visited by a rather large vessel (see below) a gun boat from the UK Border Agency. The reasons for its visit are unkown! After a very busy and mostly very sunny Wakestock Festival, we'll post some photos and a report later today or on Thursday, plus the official news on next year's festival! This week sees over 40 beautiful Dragon sailing yachts racing in the bay off Abersoch and competing for the Edinburgh Cup. 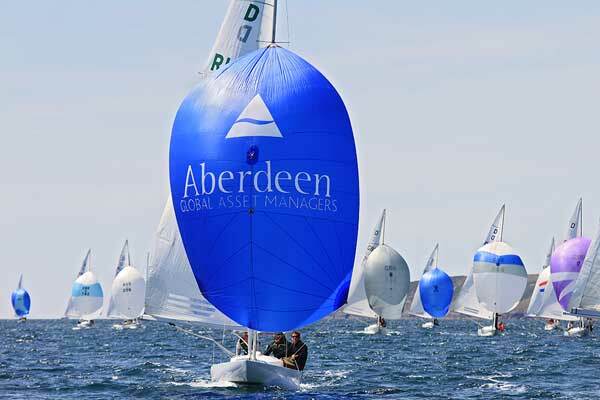 It is the first time in many years that this famous event has taken place in Abersoch and competitors have arrived from places as far afield as Japan and Russia! More details can be found on the SCYC website. Angorfa breakfast cafe is open every morning for the season from today. The Abersoch RNLI Lifeboat was called to help a broken down 25ft powerboat in Bardsey Sound on Monday. This is a treacherous stretch of water and the Lifeboat located the stricken vessel and took it under tow to the waters off Trwyn Cilan where it was met by the Pwllheli offshore Lifeboat, who took on the two and towed the vessel to the marina. Abersoch Lifeboat was on the water for approx. 2.5 hrs. The annual bracken bash, that helps control this rather noxious plant, takes place on Mon 20th and 27th June. All volunteers welcome and the meeting place is at the Golf Road car park at 7pm. Phone 078155 11695 for any info. 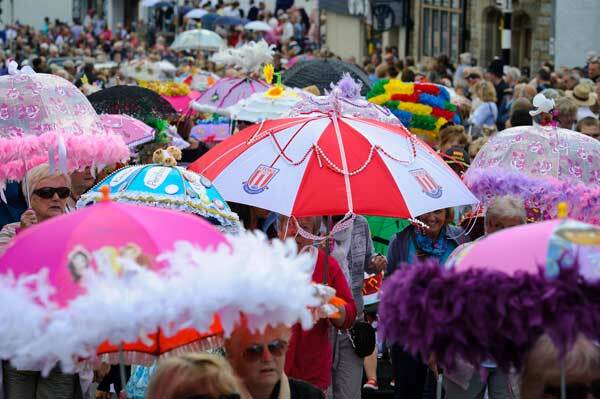 John Wormald has uploaded some photos from this morning's Jazz Festival Parade. Click here to view them. 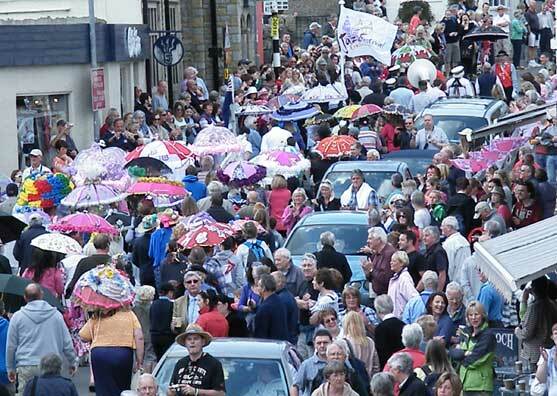 The 10th Abersoch Jazz Festival is well underway and this morning we have had the spectacular parade through the village. The Jazz Festival will take a break for a year in 2012. See www.abersochjazzfestival.com for the latest info. Despite some sunshine over the last couple of days, you may have noticed a bit of a chill in the air at times. So, perhaps not surprisingly considering the below normal temperatures, there has been a fall of snow on Snowdon on Friday. According to the BBC, ""It started hailing around lunchtime, then it snowed for about an hour," said Jonathan Tyler, manager of Snowdon Mountain Railway's visitor centre at the summit of the mountain." For the full report and photo, visit the item on the BBC website. According to a report in this weeks Caernarfon and Denbigh Herald "A businessman claims that Pwllheli Marina is a potential deathtrap and is an embarrassing eyesore for tourists." The story is due to the continued reduced access to the marina, caused by silting up of the marina basin, entrance and channel. For the full story, read the article by clicking here. Abersoch Quality Homes have one of their properties available in August due to a recent cancellation. The dates are from Sat 06 August for four weeks to Sat 03 September. The property Sleeps 8, has 4 bedrooms and 2 bathrooms. It is in easy walking distance to Yacht Club, restaurants, beaches and shops. For more info, visit the AQH website. This years Abersoch 3K and 10K saw blue skies and very warm sunshine, making the course more challenging than usual. Results are as follows: . 10K Winners: Mens NICK SWINBURN 32:54. Womens: LAURA CHAMBERS 40:04. 3K Winners: New Course Record: William Sherriden 12:27. U16 Boys: IOLA HUGHES 12:59. U16 Girls: ELEANOR JONES: 15:45. U14 Boys: CAMERON WEAVER: 14:23. U14 Girls: CARI HUGHES: 13:58 . For full results, visit the race website at: www.abersoch10k.com/results. Some photos are available to view at John Wormald's website here. Its Abersoch RNLI Open Day at the Lifeboat Station tomorrow (Friday), The 10K run on Saturday and Abersoch Jazz Festival next weekend. Details on news items below, or in the events section. On the 29th May 2011 a 12 year old girl lost her cream handbag in the children's park near the Cae Du estate in Abersoch. She is devastated because not only was her mobile phone and other personal items in the bag, but her pink digital camera with all her family photos on, was also in it too. 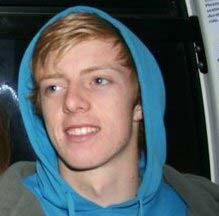 If anyone has any information, please email us at info@abersoch.co.uk and we will forward contact details. Abersoch RNLI Inshore Lifeboat was launched on Monday afternoon to assist a canoeist who had got into dificulties in strong westerly winds. The canoeist had launched from the relatively sheltered Machros end of the main beach and although well equipped, appears to have underestimated the strength of the wind that was blowing only a short distance from the shore. When the lifeboat arrived on scene, the canoeist was in the water and had been unable to get back into his canoe and was in the procees of being blown towards Llanbedrog. The Abersoch Lifeboat crew returned the canoeist and his canoe to the beach. Winds had been gale force during the morning in Abersoch and were blowing force 6 during the afternoon with higher gusts. The daily photos page on this site was an extremely popular one and we are constantly emailed by people asking what has happened to them. Well, some good news for those that used to view them as they are due to re-start again during June. We are currently working on a new format for them that will cut down the time taken to process and upload them and we will keep you posted on progress. There is a new car park opening in Abersoch later this week. Its situated on the White House Hotel site on the way into Abersoch and will hold up to 90 cars. The charge for parking will be £6 for the day and this includes the overnight period (ie its £6 for 24 hours). If you return within 2 hours of paying, you get £3 back. The annual RNLI Abersoch Open Day takes place on 3rd June 2011 from 10.30 - 3.00 at the Boathouse in Abersoch. Please support the event if you can as all money raised is used for the running of the Abersoch Lifeboat. There will be the usual hot-dogs, tea/coffee, various stalls, the lifeboat itself to explore, model aircraft display in the afternoon and all in all a fun day out. The government is "rethinking" the planned closure of the 2 main coastguard stations in Wales which means there is now a chance that the Holyhead station could be reprieved. Click here for more information. Caravan and option of a pitch has just been added to the property section. Abersoch saw an intense hailstorm and a bit of thunder yesterday evening and Martin Turtle captured the cloud that brought it in the spectacular photo below. The weather in Abersoch has been generally rather cool and showery over the last few days and it looks like more of the same this week with perhaps the weather settling down next weekend and beyond. Keep an eye on our extended outlook in the abersoch.co.uk daily weather forecasts, as we'll be following this possible trend to a settled spell of weather closely during this coming week. 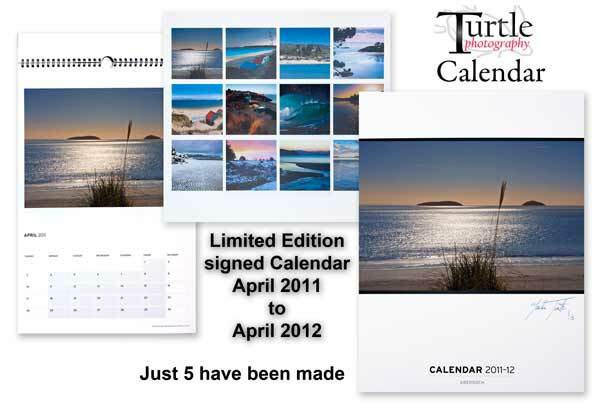 Turtle Photography has a very small (5 in fact) issue of signed calendars. These are very special calendars not only are there only 5 of them they also run from April 2011 to April 2012. These are the first calendars to feature just pictures by Martin Turtle and they have 12 great pictures depicting the seasons printed on extremely heavy high quality paper. They are available only from Turtle Photography at the Craft centre, Abersoch, so hurry as when there gone there gone. The Caernarfon & Denbigh Herald is reporting an alarming increase in the number of empty berths at Pwllheli Marina which appears to be linked to the economic situation and the silting up of the marina access. To view the full story - click here. Local band The Kickbacks who you may have recently seen playing on the front patio of the Vaynol, have also been performing further afield and recently played at the world famous Cavern venue in Liverpool. The Caernarfon & Denbigh has a report on the gig and you can view it by clicking here. Latest Additions to the line-up announced for Wakestock 2011 including THE CRIBS, KELIS, THE JOY FORMIDABLE, NEON TREES, NOISETTES, PULLED APART BY HORSES and INNERPARTYSYSTEM joining BIFFY CLYRO, THE WOMBATS, ELLIE GOULDING, CHASE & STATUS, EXAMPLE and many more at this year’s festival plus Single Day Tickets on sale Wednesday 4th May and the RAF are set to return to Wakestock with amazing aerial displays. Go to www.wakestock.co.uk for all news and ticket info. Abersoch has since some fantastic summer weather at times over the last month and 2 very busy bank holiday weekends. Just before the Easter weekend, we saw some exceptionally warm weather for the time of year and with not much traffic in the bay, the local dolphins were regularly sighted just offshore and these in the photos below were a short distance from the shore and included a youngster. The poplular Petal-á-Pot Licensed Tea Room at Abersoch Garden Centre is now opening later. They will be serving hot and cold meals from 10am until 7pm daily so you can go and sit outside on their Mediterranean terrace to enjoy a light snack with a glass of wine or beer. They are only 5mins walk from The Warren and even less to Tal-y-Fan. For more info "LIKE" their Facebook page and visit their website. It seems the stunning weather of last weekend was not only enjoyed by us humans! 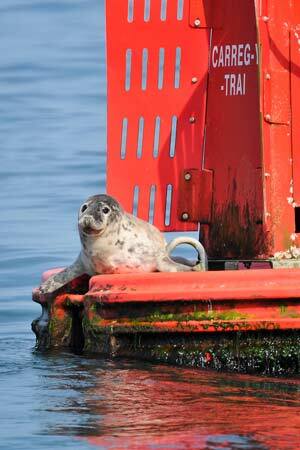 John Wormald captured this unusual scene of a seal on top of the Carreg Y Trai buoy by St. Tudwal's Islands. 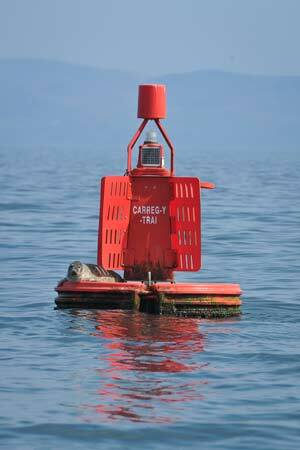 Seals can always be seen on the rocks around the islands and on Carreg Y Trai however, not many people have seen them climb aboard this buoy! The Dining Room (at Goslings) have plenty of special offers on at the moment and they are running them up to Easter weekend and then after that they have more planned from May 1st to celebrate their first birthday. For more details, click here. Angorfa B&B and Breakfast Cafe re-opens on the 15th April after another upgrade. they have a brand new dining room which has a very modern seaside theme along with various room upgrades. The Angorfa is running it's usual special offers until the end of June and availability is limited so book now to avoid disappointment. visit www.angorfa.com for details or call them on 01758 712967. 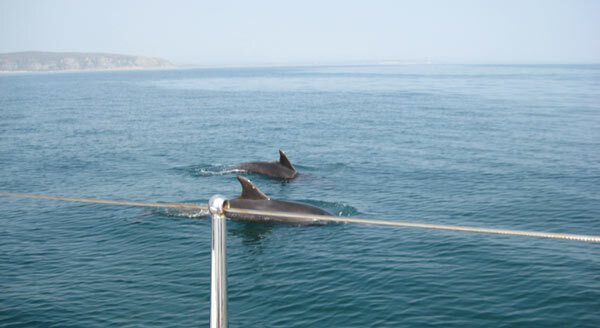 There will be an illustrated talk by Alison Palmer Hargrave (Swyddog ACA/SAC Officer) on the underwater seas round our coast at The Vaynol Arms, Abersoch on Monday 18th Aprill 2011 at 7.00pm. 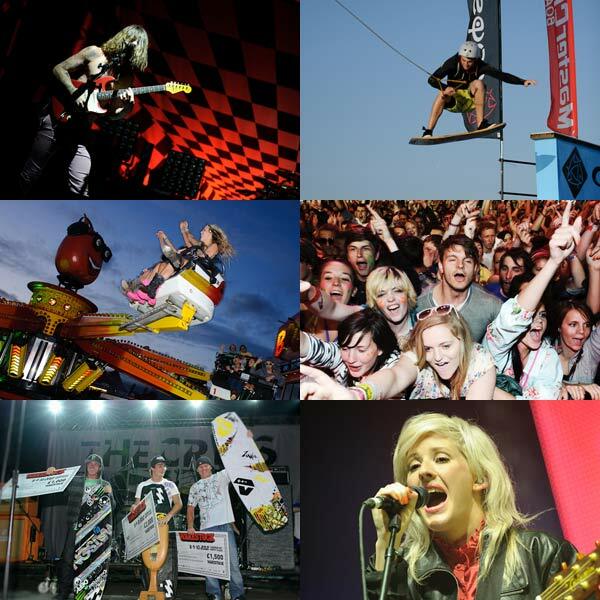 Wakestock 2011, Europe's largest wakeboard music festival returns on the 8th, 9th and 10th July this year. Organisers are pleased to announce more additions to the line up with new acts including KIDS IN GLASS HOUSES, FAR EAST MOVEMENT, KISSY SELL OUT & MC COBRA, HERVE, ED SHEERAN and many more joining the headliners BIFFY CLYRO, THE WOMBATS, ELLIE GOULDING, CHASE & STATUS, EXAMPLE and many more at this summer’s festival. Propaganda are set to get the party started at Wakestock as they host the Pre Party with TODDLA T & MC SEROCEE, GOLDIEROCKS & THE PROPAGANDA RESIDENTS plus there are FANTASTIC VIP PACKAGES STILL AVAILABLE go to www.wakestock.co.uk for more information. Don’t forget that tickets are on sale now. To book tickets all you need to do is go to www.wakestock.co.uk where you can book online or call 0845 873 7358 to book over the phone. Any enquires please call 01758 741091 Watch this space for loads more information and exciting news still to come! Tickets will go on sale in local in shops in May. Book yours today to avoid missing out on the event of the summer! Todays Caernarfon & Denbigh Herald has a story today titled, "Pwllheli harbour ‘an accident waiting to happen’." and suggests, "A keen yachtsman says that Pwllheli Harbour is an accident waiting to happen, due to years of neglect by its current owners." 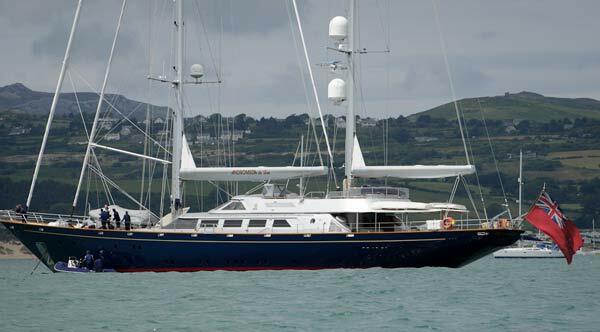 It also suggests that there are now 40 empty berths in the marina compared to a waiting list of 400 a few years ago. To read the full story, click here. A FYDD ETHOL COMISIYNWYR YR HEDDLU A THROSEDDU YN GWNEUD GWAHANIAETH? Will Elected Police Commissioners make a difference in Wales? This is a panel debate between prospective AMs standing for election on 5 May which has been arranged to take place on Monday 4 April in the Abersoch Village Hall from 7pm to 8:30pm. The topic will be What difference will the role of Elected Police & Crime Commissioners make in Wales? and will follow a standard 'Question Time' format. The debate is open to all members of the public, members of the police service or contributing to the criminal justice system in any way e.g. Neighbourhood Watch, victim support. You can pre-register questions that members of the audience would like to ask the prospective AMs at www.regonline.co.uk/gwynedd-debate (or telephone 01978 350073 for further information). Arrangements are being sponsored by a small private company based on the Wrexham Technology Park, co-chaired by Sian Pari Huws (invited, pending confirmation) & Richard Hibbs, and the debate will be conducted in Welsh and English. Communities should have an opportunity to find out more about whether the election of Police & Crime Commissioners in May 2012 will make a difference in North Wales, particularly since the proposed increase in police precept apparently means that council tax and non-domestic rate payers could be paying more for a reduced level of service over the next 4 years. Prospective AMs should be well-qualified to debate this question, as the Welsh Assembly has previously sought to make special arrangements in Wales for elected persons (e.g. AMs) to sit on the scrutiny panels overseeing the performance of the Police Commissioners in their area. The Local Government minister Carl Sergeant on 8 February carried a vote against the enabling legislation in the Assembly necessary to constitute the scrutiny panels in this way - which the Home Office Minister has been quoted as saying was "unwise", and is apparently the first time the Assembly has ever refused legislative consent requested by the UK government. Abersoch RNLI has setup a Facebook page, please "LIKE" our new page to see all the latest news and events. Plus exciting photos of the lifeboat during exercise and service. There will be a Marine Litter Art Event at Porth Neigwl on this Saturday, March 26th. Meet On beach at Main Car Park at 1030 Hrs. Join in for a family day out, be creative, help raise marine litter awareness and at the same time be active and help clear up the mountain of plastic debris from the beach. Make your statement and be creative with Marine litter. 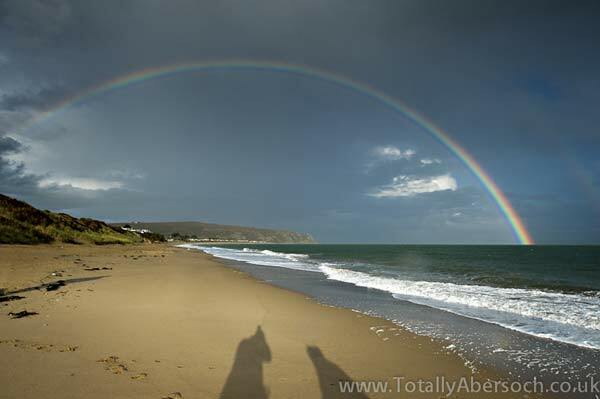 Abersoch.co.uk will be using twitter this coming season to issue weather forecast updates and the latest Abersoch news. Our Twitter profile name is abersochdotco and it can be found by clicking here. Another season started in Abersoch this weekend with the re-opening of the caravan and chalet sites in the area. 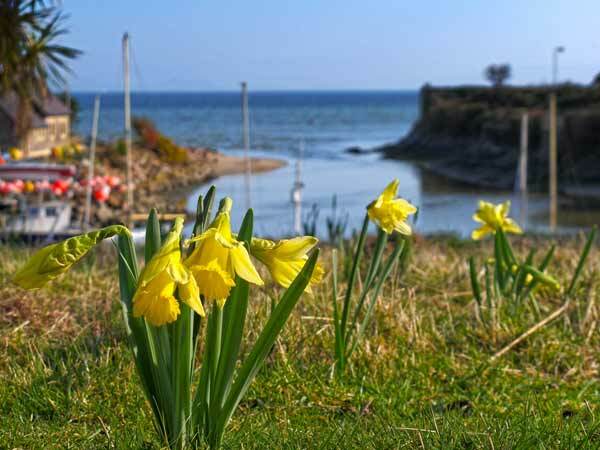 The daffs are also waking from the long winter and Martin Turtle of www.turtlephotography.co.uk captured this image today of some overlooking the harbour. Martin has had a busy winter taking photographs and you can see some of his latest images on the "new pictures" section of his website and also via his facebook page. Martin also has some new prints on the wall of the gallery and also tells us that his very popular book, "Llyn, A Magical Place", has just been re-printed as the first run completely sold out! Signed copies are available from his studio at Antur Aberuchaf. The high and low tide times are now being updated again on the home page. Pwllheli and much of the Llyn Peninsula is one of the few areas of rural UK set to take part in trials for the next generation high speed broadband services. The timing of this trial and whether Abersoch will benefit is yet to be known but it could provide an important boost to the local area. The original BBC story can be read by clicking here. Our popular property for sale section has 2 new properties listed - click here to view this section. The section is popular with those trying to sell their caravans or chalets on certain local sites. If you are interested in advertising, please contact us for details. As you are probably aware, the Abersoch.co.uk website has been in a winter semi-hibernation since the end of October. We will be waking up some of the popular, regular features such as the daily weather forecast in the second week of April when we will also be addressing the webcam situation and performing maintenance and upgrades where required. Easter is very late this year which does have the potential benefit of maybe being blessed by warmer weather. We will be keeping a close eye on the long range weather charts for the Easter period when we resume the daily forecasts. Found on Abersoch main beach at the New Year’s Day dip - a small girl’s silver bangle. Please call Roy Taylor on 07881 500942 if it is yours.